On Thursday, June 7, 2018 at our regular Noon Club meeting at the McHenry VFW, ImaBridge Africa updated members of the Rotary Club of McHenry regarding its recent service trips to Nigeria. Rotarian and Founder of ImaBridge Africa Rev. Fr. Godwin Asuquo is reaching out to Clubs of fellow Rotarians. ImaBridge is encouraging collaboration and partnership with ImaBridge Africa in connection with its ongoing international projects in Nigeria. Rev. Fr. Godwin Asuquo is a Paul Harris Fellow Rotarian from the Rotary Club of McHenry. He is also the Founding Director of ImaBridge Africa (IBA) and the Pastor of St. Patrick Catholic Church in McHenry, IL. Rev. Fr. 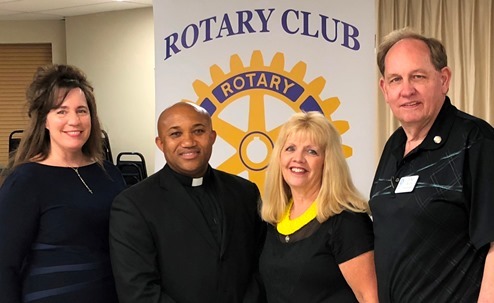 Godwin Nsikan-Ubom Asuquo, Pastor of Saint Patrick Church in McHenry, is the recipient of the Rotary Award for Humanitarian Services in connection with his efforts in forming and developing the ImaBridge Africa, USA, team. See his Founder’s Statement. Some IBA board members and Fr. Godwin recently had the opportunity to meet many Rotarians at the Rotary District 6440 2018 Conference; they were inspired by the display of altruism. IBA was started 10 years ago and is a 501(c)(3) charity that helps the rural poor in Africa (Nigeria) so they can solve their leading problems and develop their communities. In 2015, the local Rotary in Uyo, Akwa Ibom State, Nigeria nominated Rev. Fr. Godwin Nsikan-Ubom Asuquo as the Rotarian of the Year given IBA’s projects in the areas of Health, Education, Clean Water, and Microfinance in their communities. IBA’s services are in line with the Rotary International Avenues of Service in view of Youth, Vocational and Community Service projects, thus becoming an excellent form of broad, deep, and effective International Service. Annually, IBA organizes a group of volunteers from the USA for mission trips that have impacted many lives in the rural communities in the areas mentioned above. In particular, over 130 students received financial scholarships and have graduated from universities. IBA has drilled 10 boreholes (wells) providing clean water, has provided free yearly medical services for approximately 60,000 people, opened a clinic in partnership with the local Rotary Club of Uyo, along with the provision of microfinance for economic empowerment. IBA’s major project currently at hand is the building of the ImaBridge Medical Center, a full-service hospital. In addition to much needed healthcare services, the hospital will provide employment for the community. Rotarian Father Godwin and other IBA Board of Directors invite you and other Rotary Clubs to partner with IBA in any of their international project areas. IBA’s board and team members are available to visit Rotary Clubs for a presentation and discussion. ImaBridge Africa in listed on Rotary District 6440’s Speakers Bureau.